Today I am going to share you about Push Notifications for posts in WordPress. After reading this article you will be able to understand the importance and benefits of using push notifications on your website. Also, you will be able to get more traffic to your site. While writing a new post we always want to target our audience who will read them. However, it’s not possible to reach our desired audiences perfectly. Many websites out there who are competing for same type audiences. So, it becomes difficult to reach your contents forefront to your desired audiences. 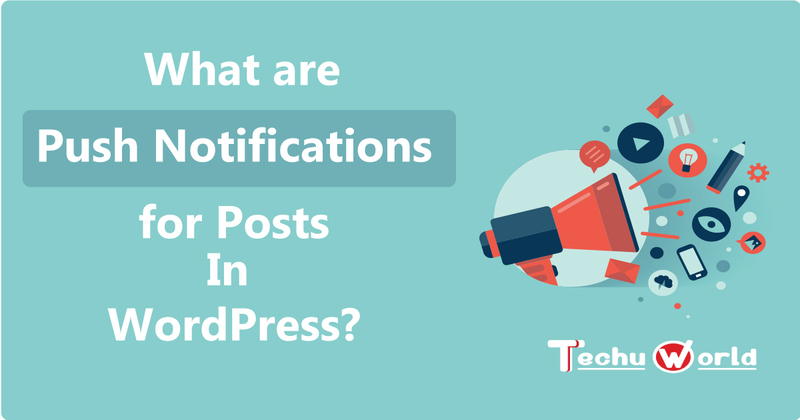 Using push notifications for posts in WordPress is a smart way to notify your visitors about new post arrival. Push notifications for posts work like sending a direct message to your visitor’s phone or desktop. By this, you know that your visitors are aware that there is something new on your website. Although push notifications are very little but can bring you lots of visitors. Which helps you to increase your website’s conversion rate. Today, I will discuss on Push Notifications for posts. Exactly what are they? Their working methods and how could you be benefited from push notifications? What are Push Notifications for Posts? Push notifications for posts are a kind of notifications that gives an alert of new posts arrival on any website. Using push notifications for mobile phone has been practiced for many years. And now it’s becoming popular among websites. Near about 25% website runs on WordPress. Enabling push notifications on WordPress will notify your website’s subscribers about new post arrival on your desktop or mobile screen. The notification message will be sent when they are connected to the internet. So, push notifications would be very beneficial to you. You can be staying in contact with your subscribers even when they are not on your website. Benefits of using push notifications on your website. Push notifications are not limited to play a vital role to generate leads on big e-commerce websites. Or notify new post arrival for bloggers. There are many more positive sides of using push notifications. Sending content’s link or content’s overview in email is a great way to bring visitors to your site. But it could be very time consuming to open email and type messages then send. Sometimes, you won’t get time to send emails to your mailing list. Push notifications work like sending notification emails to a mailing list. Subscribers must opt in to receive push messages from your site. So, you are getting your targeted audiences and can engage them on your post. However, sending notification emails. Although it works same as emails but has some difference. Push notifications will immediately be visible on PC screen or mobile device of your subscribers. They don’t need to check their email as you will get maximum exposure. People searches for what they are interested in. You must create engaging contents. Only then, your subscribers will found interest in your content. Suppose you have created some engaging consents and your audiences doesn’t know about them. Then how will they come to your website? Push notifications can help you by sending notifications to your subscribers. Regular reminders by push notifications can also help you bringing your audiences back to your site. Push notifications can be used on your e-commerce site. You can send promotional offers or new sell campaign notifications with it. If you are an e-commerce store owner then you should look at 5 ways to recapture your lost customers in 2017. Either its Blog or e-commerce store, push notifications are all in all. It can drive more customers to your website. Don’t late more and read how to set up push notifications for posts in your WordPress site. You can send e-mail from contact us page which is located at the right bottom of my site. Thanks for sharing this blog. Push notifications are helpful for new updates it will increase our website traffic too. Yeah, right you are ! !